This wonderful Image-Mosaic is the Highest-Resolution look yet at the Haze Layers existing in the Plutonian Atmosphere. The Mosaic was constructed by putting together 4 (four) Panchromatic Images from the Long Range Reconnaissance Imager (or "LORRI", for short), splashed with the Ralph/Multispectral Visible Imaging Camera (or "MVIC", for short) four-color filter data, and all acquired by the NASA - New Horizons Spacecraft on July 14, 2015. The resolution here is roughly 1 Km (such as about 0,621 miles) per pixel; the Sun illuminates the scene from the right (Dx). Many Planetary Scientists believe that the Haze (just like the one that surrounds the Saturnian moon Titan) is a Photochemical Smog resulting from the action of Sunlight on Methane and other molecules found in Pluto's Atmosphere, which produces a complex mixture of Hydrocarbons - such as Acetylene and Ethylene. These Hydrocarbons accumulate into small Particles, a fraction of a micrometer in size, and scatter the Sunlight to make the greenish-blue Haze that we can see. 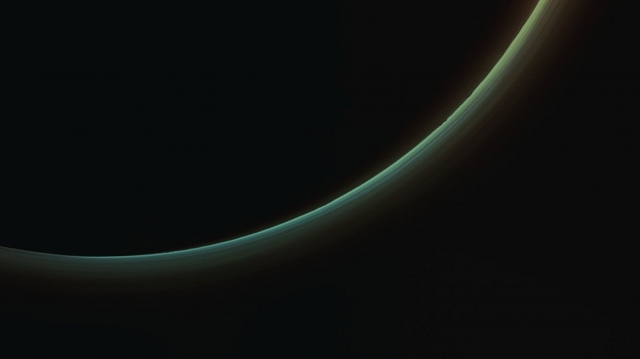 Afterwards, as they settle down through the Atmosphere, the Haze Particles form numerous intricate, horizontal Layers, some extending for miles and miles over and around Pluto. To be more precise - and as far as we know -, these Haze Layers extend up to an altitude of more than 200 Km (such as about 124,2 miles) as to the Surface of Pluto. Adding to the stark beauty of this picture there are also the Mountains on Pluto's Limb (on the right - Dx -, near the 4 o'clock position), other Surface Features just within the Limb (and always to the right - Dx), as well as - just barely visible - Crepuscular Rays (---> dark finger-like Shadows to the left - Sx), extending from Pluto's Topographic Features. The image (which is an Original NASA - New Horizons Spacecraft's Approx. Natural Colors and NON Map-Projected Image-Mosaic published on the NASA - Planetary Photojournal with the ID n. 20362) has been additionally processed, magnified to aid the visibility of the details, contrast enhanced and sharpened, Gamma corrected and then re-colorized (according to an educated guess - or an informed speculation, if you wish - carried out by Dr Paolo C. Fienga-LXTT-IPF) in Absolute Natural Colors (such as the colors that a normal human eye would actually perceive if someone were onboard the NASA - New Horizons Spacecraft and then looked outside, towards the Dwarf-Planet Pluto), by using an original technique created - and, in time, dramatically improved - by the Lunar Explorer Italia Team.